Thousands of K-12 students and members of the local community had the opportunity to welcome Col. Chris Hadfield to the University of New Brunswick in Fredericton on Tuesday thanks to UNB’s Andrews Initiative. Col. Hadfield is the former, and first Canadian, commander of the International Space Station. Col. Hadfield told an auditorium packed with students from New Brunswick’s Anglophone West School District, and those watching online through a live-stream, that he wanted to be an astronaut since the age of nine. Since 1992, he has been an integral part of both the Canadian and American space programs. In Dec. 2012, he embarked on a five-month stay in space, where his twitter posts about life aboard the International Space Station gave millions around the world a glimpse into life in space. Hadfield encouraged the students to explore and discover their dreams and passions, and work hard to achieve them. 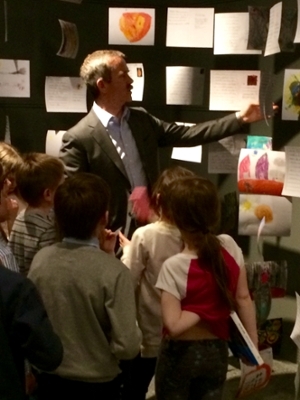 To coincide with Col. Hadfield’s visit, the UNB Art Centre opened Postcards from Mars, a partnership between TD Bank Group, students and teachers from the Anglophone West School District, and the University of New Brunswick’s Andrews Initiative. Over 1,500 K-12 students from 37 schools across the province are participating in Postcards from Mars. Students were invited to imagine what life might look like on planet Mars and design and compose a postcard to a friend or loved one back on Earth. Their work will be displayed at the UNB Art Centre in Memorial Hall, 9 Bailey Drive, UNB Fredericton, from April 17 until June 18. Postcards from Mars will officially launch on Saturday, April 25 at 1 p.m. and will feature science activities for all ages. Science East, representatives from the sponsoring TD Bank Group, UNB’s UFirst: Student Recruitment team, and the Canada Wide Science Fair (May 11-16 at UNB Fredericton) will be on hand to support the festivities. Art lovers of all ages, and especially students, teachers, and parents, are invited to attend. "We believe that one of the best investments we can make is to ensure that children and youth have access to creating arts and culture in their own communities," said Tara-Lynn Hughes, senior vice president, TD Canada Trust. "Providing learning and skills development for students through the arts is just one way TD is committed to making a positive and lasting impact in New Brunswick." The UNB Art Centre galleries are open from 9-4 p.m. weekdays and for special events. Admission is free to members of the public and everyone is welcome. UNB’s Andrews Initiative, launched in 2011 by UNB President Emeritus John McLaughlin, is thrilled to welcome Chris Hadfield to UNB as part of this year’s signature lecture series.